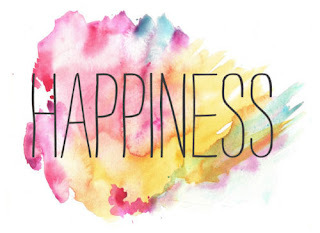 If we think positive thoughts or we are in sync with positive side of every thing, our mind is at peace and in happy state, and we feel pleasant and very happy for what we are and what we have. We tend to handle every situation patiently and peacefully. We all know that, peaceful mind can solve every problem easily. Once any negative thought come to our mind, we become worried unnecessary, we loose our patient and cool, and any solutions do not come to our mind, and we may become more panic, and do more mistakes. One negative thought bring along many more unnecessary negative thoughts. It many be past bad experience with some one, or just your worries. We all have experienced this many times, Right ? You may have faced this many times, that if one thing goes wrong in morning, and spoil our mood then rest of day will go miserable or not the way you wanted it to go. For example, you might have waked up late or not at that time you wanted to woke up. So this thing goes wrong in morning and you become panic after that. Then in hurry you spill your coffee/tea, then you shout at you kid, since he/she is not doing hurry to get ready for school. Then after you get traffic on your way to office. After that it took so long to get parking for your vehicle. After that you get scold for coming late, your presentation might not get that way you wanted ....list is endless. Have you ever think that why only one wrong thing have spoiled your day ? Once one thing went wrong, your mind switch from Positive thought to Negative thought. You woke up late, so you got panic and you got fear of reaching office late, your mind shift to negative thought, which have decrease all your thinking ability to solve your problem. Then after series of negative actions started.You could have changed this, by controlling your thoughts. After you woke up late, if you think not to get panic, and do all possible household chores in remaining amount of time, and do things bit faster with lot of patients, and do not loose your cool, then you might reach office on time. Your rest of day might go as you wanted it to go or nearer to that. At least not miserable. I think all of us know benefit of positive thinking, but we all have faced that it is really difficult to be positive all the time. Let me give you some incite on how we can be positive most of the time. When we are thinking negative thoughts, we do not realize that and slowly our mind get filled with lots of negative thoughts. Until we realized that, it may be very late and our mind got surrounded by lots of negative thoughts and we become sad or stressed. To overcome this, we can depend on our feelings or mood. Our feelings or our mood can help us in realizing that we are on negative thought. We can have continuous check on our feelings or on our mood. If we are feeling good, or in good mood then we are on correct path and having positive thought. If we are not feeling good, or mood is not good, then we need to immediately change our thought, since we are on negative thought. 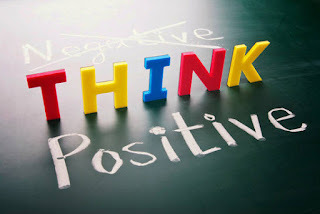 Now that we have identified that our thoughts are negative, we should do something to change our thoughts or thinking. Listen to some good music to change your mood. Read some motivational book or self help book. This can help you calm down your mind. Do some meditation or yoga. It will give you more control over your thought process. Surround your self with positive people. Have at least one good friend, with whom you can talk and change your mind to positive. Stay away from unnecessary negative discussion. List 5 things that you are grateful or thankful for. This will make you feel content. Remember old days (childhood memories or old good vacation) that can bring smile on our face. Take MIND mini vacation. Close your eyes, think of the place where you dream to go, and imagine your self at that place enjoying with your friends and family. This will work like magic in changing your mood. Do not over think. Experts says that "85 percent what we worry about never happens"
Every situation do not deserve your time, energy and attention. So identify those and act smartly. And stay calm most of the time. Forgive easily for peace of your mind. Think before you speak, so you do not need to think later. Start your day with positive affirmation. Wake up early. Spend time with yourself. Do some yoga or meditation. Be grateful for this morning and many other things. Plan rest of your day. List out your priorities. So you become more clear with your task and life goals. You will realize that, things are going according to your plan. Be child again, who used to play with friends. If possible, include some sports like badminton, cricket in your weekly routine to charge up for rest of the week. You will feel rejuvenated. If any bad incidence occur, then ask your self this question, "Will it matter after 5 years?" If NO, then forget and move on. If YES then consider it as a life lesson and move on. Below are some good books that can help you think positively. 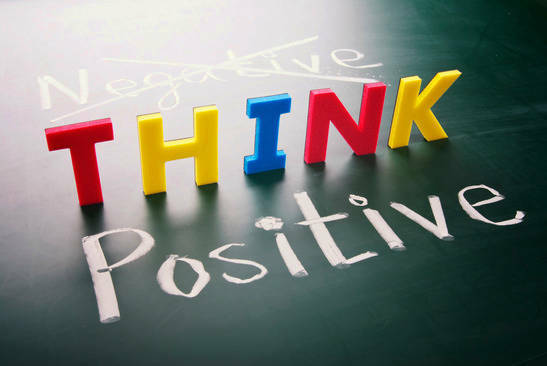 Though, I have listed some ideas to help you in positive thinking, but you may find it bit difficult to apply it on your day to day life. As it needs more and more daily practice, like I am still practicing it for my positive thinking process 😊. If you are mother, then you may find it little bit more difficult then others to apply POSITIVE THINKING on your day to day life, since kids keep examine your patience level again and again, and keep driving you crazy. (Click Here to read on How to overcome Post Delivery Depression in mothers). But don't loose your courage, and keep thinking positively, till it become your daily habit. 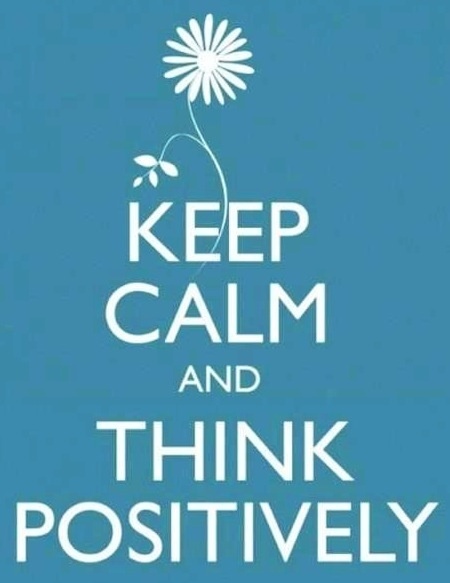 Once you become habitual to positive thinking, it will be very beneficial. 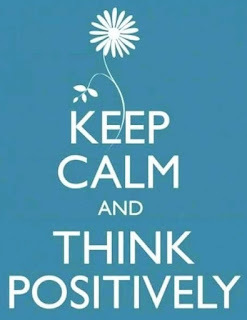 So Keep Calm and Think Positively.